Norman and Sylvia June 1979 with Freightliner, Cat, and swamp buggy (the mean machine). Friday, June 29, 1979—after eight months of work and planning we leave Motley, Minnesota with a fully loaded rig. The truck is a 1964 Freightliner semi-tractor with the frame extended. The bed on it measured 24 feet—and we were pulling a 20 foot pup trailer. The entire load of gear and equipment weighed 73,000 lbs. The welding work on the swamp buggy we were hauling (nicknamed the “mean machine”) was done by Glen Peterson. We rushed all morning, then met Roger Shequen at the El Ray and had dinner. He has been a very big help. There were a lot of other people that gave me help and encouragement. My truck batteries were low and Roger pulled me with the truck he was driving. When we got to Wadena, we stopped and checked the load and tires. Everything was alright, just had to add a little air to a few tires. When we got near Detroit Lakes, it was raining hard. The heater hose broke, so I pulled over to the side of the road and cut the bad end off and re-clamped the hose into place. Then we started out again. Stopped on the west side of town, camped and slept in the cab of the truck. We continued on, but the entire week was not without its tribulations. Not far into Canada, we had problems with the truck’s transmission and had to make repairs in Edmonton. Saturday, On July 7, 1979—we left Edmonton at 6:00 a.m. and the road was really hilly. We saw two deer and two large black bear. The bear we saw near McBride was very tall and thin. Both the bears we saw were big and it’s not unusual to see them feeding along this highway. We learned a bridge was washed out on the normal road we would have taken to Alaska, so to get around it, we took a detour to Prince George and on up to Cassiar highway. Twenty miles east of Prince George we saw a twoyear-old bull moose grazing in the ditch and one dead deer. We had a flat tire on an inside wheel of the truck near the top of a steep hill. I put blocks under the truck wheels and the trailer and changed it. Coming in to Prince George there is a steep hill that goes down to the river there. Then you meet the railroad track and cross the river on a railroad bridge barely wide enough to accommodate a narrow road on each side of the tracks for vehicles. As I started down the hill, the heavy load we were carrying was pushing the truck hard. The engine is a Cummins 250 and it is to be run at 1,800 to 2,200 RPMs. If you push it over 2,200 RPMs the engine can fail. So as the RPMs increased, I would kick it up another gear to help save the engine—but we would run a little faster each time I did that. It was awfully windy and one of the mud flaps got to really flapping around, knocking the valve open on the air tank causing our brakes to overheat. Suddenly we didn’t have brakes. I knew once we got to the bottom of this hill, we were going to have to make an extremely sharp turn onto the bridge. I’m kickin’ it up another gear—and another gear—and another gear. We are picking up speed alarmingly fast. Thinking we wouldn’t make it, I told Sylvia to jump while she had the chance but she wouldn’t do it. Instead, she said, “I’m ridin’ it down with you.” I have to give her a lot of credit she never even screamed. We were careening faster and faster down the hill and finally at the15th gear, the truck reaches 2,800 RPMs. I expected it to blow any second. When we go to the sharp turn approaching that narrow lane, we were looking right down into the river. I made up my mind I was gonna put that truck across the bridge. Going through the turn, our rig leaned dangerously out, threatening to go over, but it held. The trailer cracked the whip behind us and I put her right into that slot—never even touched a mirror on either side. There were only inches. Still moving much too fast, the trailer slid over and we blew out the two outside tires on the right side of it. Once across the bridge, we saw a dirt road straight ahead. We went down that for at least the equivalent of a couple of city blocks, finally coming to a stop. We pulled it over to the side and just sat there and talked a little bit to regroup ourselves. I said to Sylvia, “You know, I think maybe we should dig that bottle of whiskey out of the grub barrel. We haven’t had a drink in a week. Maybe now’s the time.” She thought that was a good idea and we each had a drink. We stayed put and slept there at Prince George for the night. Taken from the manuscript of Norman’s book, 10,000 DAYS IN ALASKA. 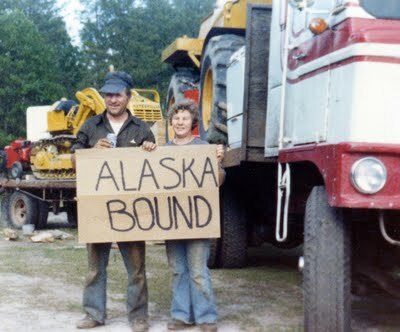 This entry was posted in Journal Entry and tagged 1979, Alaska, Cassiar Highway, Cummins 250 engine, Edmonton, Freightliner, Motley Minnesota, Norman Wilkins, Prince George Canada. Bookmark the permalink.